The Qatar Players’ Association (QPA) last Thursday hosted representatives from FIFPro, the International Association of Professional Footballers, to discuss initiatives aimed at aligning the QPA with FIFPro-approved standards on how to best represent players. 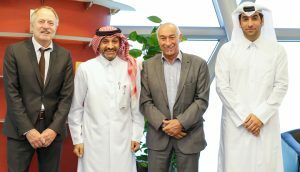 FIFPro officials welcomed recent developments between the International Labour Organisation (ILO) and the Government of Qatar who have entered into a three-year technical cooperation commitment aimed at strengthening national regulations and practices and implementing extensive labour reforms. The agreement provides an outline for ensuring employers and workers realize fundamental principles and rights at work, in line with international labour standards. As part of its commitment to FIFPro, the QPA said that an agreement has been reached between relevant government bodies and officials from the Qatar Football Association (QFA) and Qatar Stars League (QSL) to immediately implement the reforms announced by the Qatari government within the footballing administrative bodies. The ‘Kafala’ system will be replaced by an employer-employee contract. “We’re pleased to see the end of restrictions on freedom of movement,” Piat said. “By elevating the rights of players, it provides a promising new platform to build the game in Qatar. It is vital that players are adequately represented and with that in mind, we look forward to ratifying the QPA’s status as a full member of Fifpro at our Board Meeting in early February 2018”. FIFPro and the QPA took the opportunity today to announce that a solution had been found in the long-running dispute between French-Algerian footballer, Zahir Belounis, and El-Jaish Sports Club. Belounis left Qatar in late 2013 amid claims of unpaid wages. The QPA and FIFPro are now working towards reviewing and the implementation of a standard employment contract to guarantee minimum working conditions, as well as reviewing the existing Foundation of Qatar Sports Arbitration rules to ensure that players have access to a fair, football-specific legal system in the event of dispute. “We have worked hard to establish the QPA as an integral entity within the Qatari football family and as a respected and independent players’ representation organisation on the international stage.” Al Ansari said. “The Zahir Belounis’ case underlined the importance of the existence and recognition of the QPA. We worked diligently – along with Fifpro and numerous local stakeholders to ensure that solutions were found satisfying all parties. “We are pleased to hear that our status as a full Fifpro member will be approved, and very much appreciate President Piat’s support. This is an important step for the development of our organisation. Existing within Fifpro’s framework provides us with the support system required to properly ensure that the rights of our players are protected inside and outside of Qatar and we look forward to a long and productive relationship.